Based in Kornberg, Germany and founded in 1921, Braun have been a leading name in personal care and grooming for almost a century, specialising primarily in electric shaving, they are the pioneers in producing premium men’s electric shavers. They also manufacture some of the words leading oral care products, innovative beard trimmers, best woman’s epilators, grooming, skincare, and wellbeing products. Previously wholly owned by the Gillette Company, the firm has since been bought by Proctor & Gamble, joining a list of products in their family including Old Spice, Pantene and Gillette. De’Longhi have been responsible for manufacturing small Braun appliances since 2016. Though Braun has a long list of well established and successful products, today we’re going to be talking about, and comparing their most resent range of electric shavers for men. 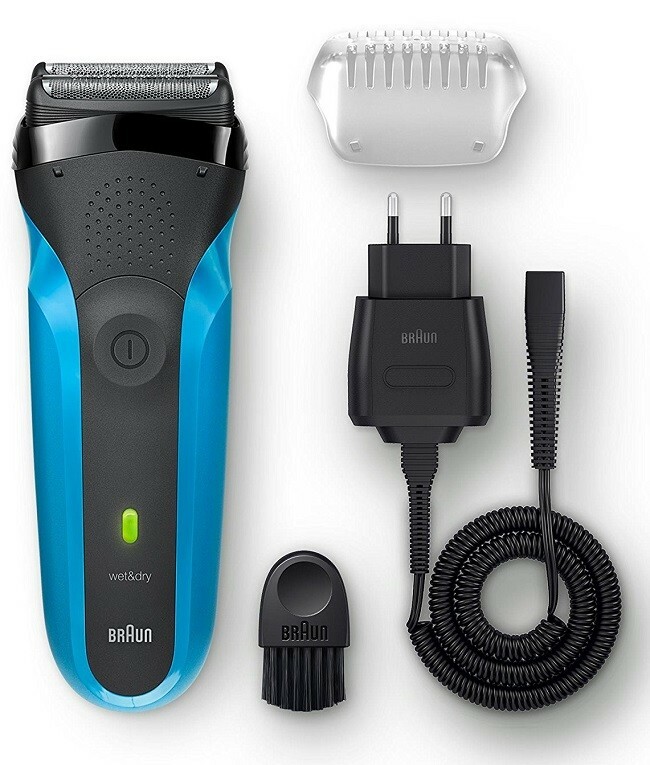 A basic yet very efficient shaver, that's currently voted our best buy for value and efficiency. Looks, great, works great, and offers some advanced skin comfort and cutting features. Extra shaving foils captures more hairs with each stroke, plus Sonic Technology. 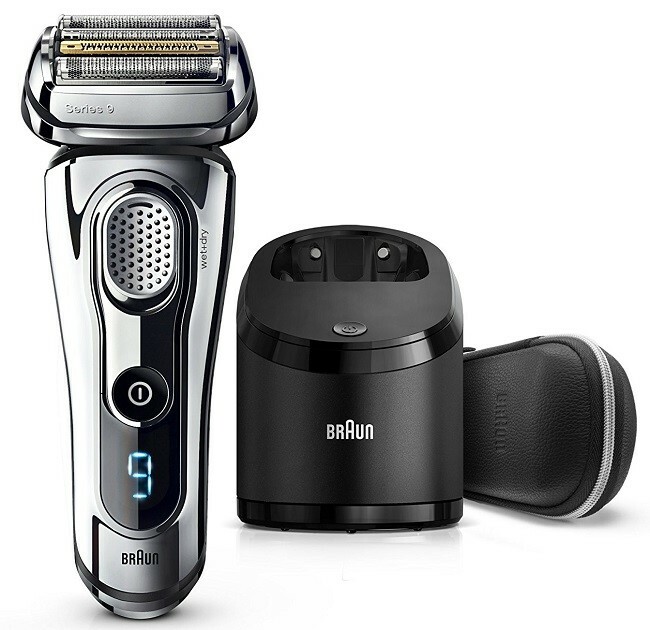 With patented technology, Titanium coated blades, its Braun's most advanced shave. 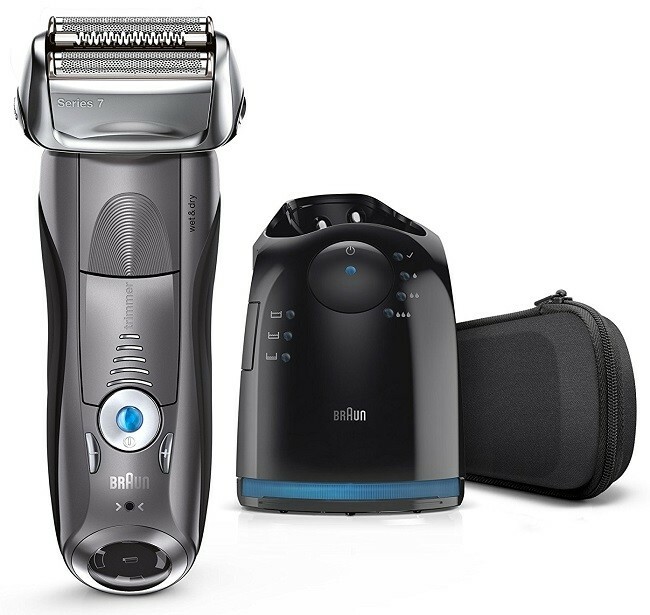 For shaving and grooming, Braun offer a comprehensive list of appliances in a broad range of price points. Covering everything from small travel shavers to larger, feature-heavy products, Braun’s entry level shavers start at the Series 3, and offer excellent standards of effectiveness for a respectable price. Starting at around the £30 – £40 mark, you’ll find the Braun Series 3 310s – offering the most cost-effective shave in the range. Despite a predictably slim range of features, these products are nevertheless of a high quality considering the price. Buying a Series 3 shaver, you will get a triple-flex shaving head with a middle trimmer for capturing longer or more stubborn hairs. As a smaller product you’ll also get a decent charge-to-use ratio – useful if you’re out early in the mornings and forget to charge it the night before. About five minutes plugged in will get you a quick shave. One would expect a product like this to be waterproof, and the series 3 are designed to work perfectly in the shower with gel or foam. Unboxing this won’t take long, as you’ll just be getting the basics – all you need for a quick shave: the shaver, a travel pouch, a rudimentary protective cap, and a SmartPlug charger – depending on the model. If you opt for something a little higher up in the series 3 range – like the Series 3 380s – you’ll get some extra power, and grooming and trimming attachments included. They are available in a range of colours – Black, Blue, Red and White. In the lower-end of shavers by Braun is the Series 5 collection. These products are the cheapest available from the company to offer FlexMotionTec, a proprietary system of independently flexible blades on a fully articulated head. 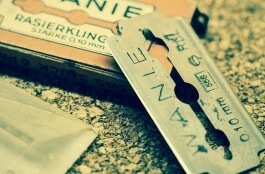 A step-up from the three-flex shavers, the idea is to maintain maximum contact with the skin. The blades themselves are designed to alternately capture and cut hairs, meaning you’ll spend less time going over trouble-spots and difficult contours. 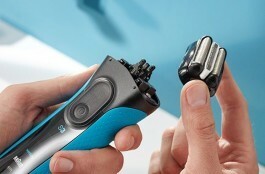 Also included is a precision trimmer for moustache and sideburn alteration, which is a bonus. Battery power is roughly the same as less expensive ranges, meaning five minutes of quick-charging will get you a quick shave from a flat battery, with a full hour charging the device to maximum. Series 5 shavers also come with alcohol-based Clean&Charge station, which cleans and lubricates the blades as the device charges. At the mid-range of the premium Braun shavers is the Series 7 range with Intelligent Sonic Technology. 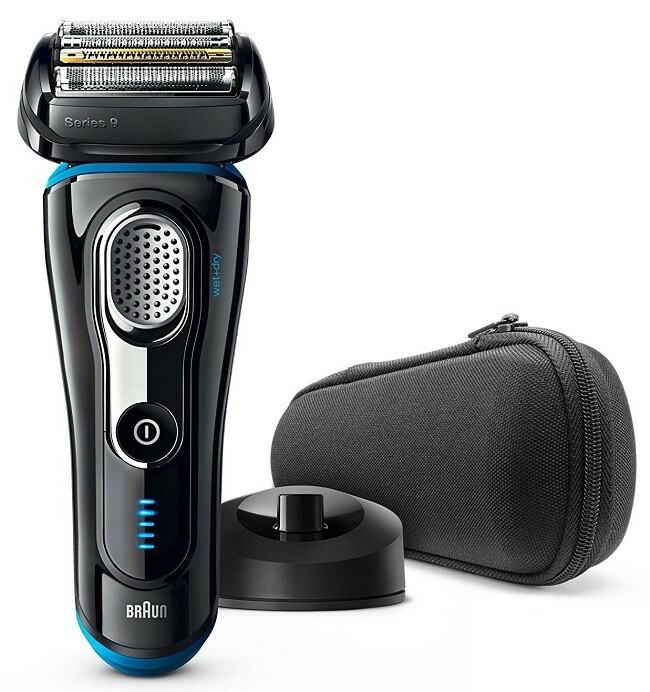 Using the same shaving elements as the Series 5 with the inclusion of an extra skin guard, these products also vibrate at around 10,000 vibrations per minute, ensuring maximum cutting speed on contact with the skin. As a result you’ll be shaving much faster than with a traditional shaver. Series 7 shavers themselves are similarly positioned to the previous series, offering the same contour manoeuvrability. You can however lock the shaver head, which allows more precision when trimming areas near the nose or chin. As with the Series 5, you’ll get a precision trimmer for moustache and sideburn alteration. 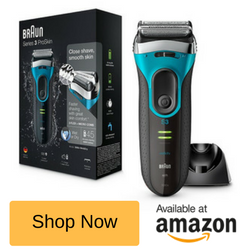 Prices jump by around a hundred pounds here marking the transition into the higher-range of products, as well as the inclusion by Braun of ‘intelligent’ features; if you’re after a simple shave at a reasonable price, here is the point at which you’ll likely stop browsing and choose your product. 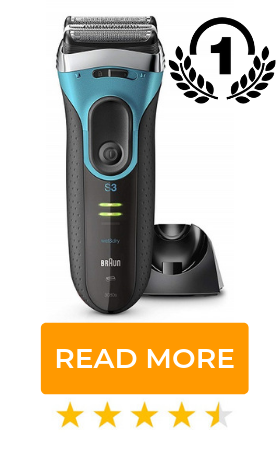 Now we’re moving into the big league with Braun’s top of the line electric shaver range, boasting some of the most sophisticated features available on a shaver, the Series 9 range offers a premium shaving experience for a significant price – expect to pay several hundred pounds for Series 9 Shavers. Available in chrome as well as the usual blue and black, the series 9 shavers offer the same Intelligent Sonic Technology as the Series 7 range with the addition of titanium-coated extra sharp blades for maximum cutting power. This range has the highest variety of blades, adding a lift-and-cut trimmer, direct trimmer and skin guard to the standard Optifoil layout. The goal is to lift flat-lying hairs in one pass, ensuring that you spend the least time shaving possible. 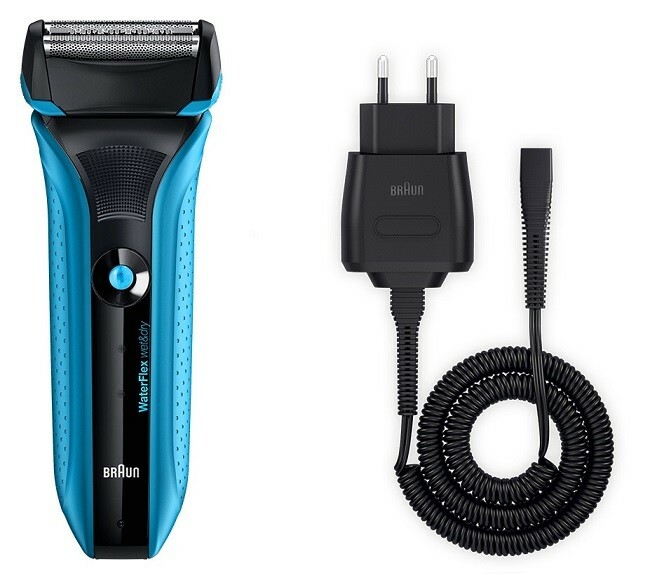 Similar to other Braun electric shavers, these combine an adjustable head with manoeuvrable blades – the difference is in the directionality, with the Series 9 offering a 10-directional pivoting head. The shaver itself has been re-designed to fit more comfortably into the hand, which is something worth considering if you’ve got significant facial growth. If however you’re not shaving daily, it’s probably that you could get away with a series 7, or perhaps even a Series 5 product at half the cost. All Braun shavers operate with the same battery, so expect standard charge times and battery life. An LED display tells you battery status, blade cleanliness and travel-lock status with a few clicks. There’s actually surprisingly little coming out of the box with these shavers, as you’ll only be getting the standard get-up with the addition of a cleaning brush and Clean & Charge station. 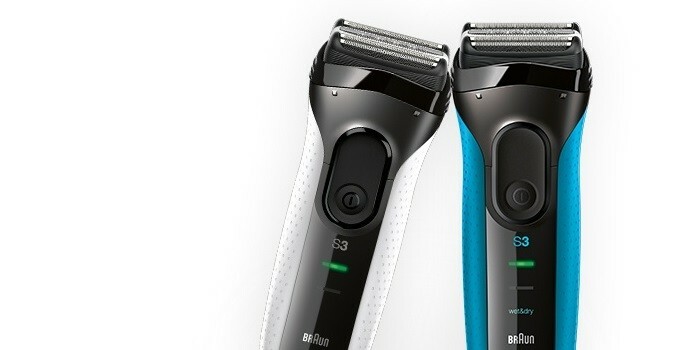 The cost is all in the shaver itself, rather than any accessories. Outside of the standard divisions, Braun also offer some specialty products within the series themselves: the WaterFlex Wet & Dry shaver and the CoolTec options offer extra functionality on top of the standard parts. WaterFlex shavers are standard shaves with enhanced waterproofing and rubberised grips for use in the shower or bath, with foams and gels. WaterFlex trimmers are waterproofed to IPX7 standards, meaning they’ll survive submersion up to five meters, and will have no trouble in the shower. A little more advanced is the CoolTec range, which allow heat to build in the shaver head to facilitate cutting, then cool the skin without the need for gel or lotion application. There’s a thermo-electric cooling agent between the foils themselves, but the CoolTec shavers are still waterproof under running water. Available in a wide range of prices and with a host of features for your needs, there’s a Braun product for clean shavers and facial hair stylists alike. There’s a clear progression of features at each price point, so it’s worth taking the time to make the comparison to help decide which product suits you best.